In 2006, Vibhu Bansal took on the challenge and the growing need of scraping or harvesting unstructured data from websites across the Internet regardless of format and "normalizing" that data for useful, reliable and valuable information. 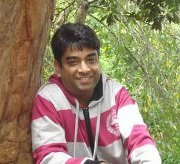 Vibhu, started his career in Computer Sience in 1998 and gathered expertise in many verticals such as Payroll, HRIS,and other MIS applications. In 2007, after freelancing for about an year, he left his regular job to take up challenges in the rapidly changing IT industry and has since been applying his intricate knowldege of database driven websites to develop solutions to harvest data from the web. Fast forwarding to today, we have grown exponentially and have 8 programmers working exclusively on scraping projects to better serve our global clients within a wide range of industries. We and our staff are proud of delivering excellent customer value with the most innovative tools, resources and Integration technology to provide the best and the most competitive web scraping solutions. Our powerful web scraping services employ proprietary algorithms designed to anonymously and non-intrusively harvest and transform unstructured Web content, typically in HTML format, into structured data that can be stored and analyzed in a central local database or spreadsheet. Uses of Web scraping include online lead generation, price comparison with your competition, weather data monitoring, website change detection, Web research, Web content mashup and Web data integration.